The 2017 Championships at Wimbledon are underway, and while the number of top-level Americans at the Grand Slams has dwindled in recent years, especially on the men’s side, there is still no country that produces more of the players at Wimbledon. 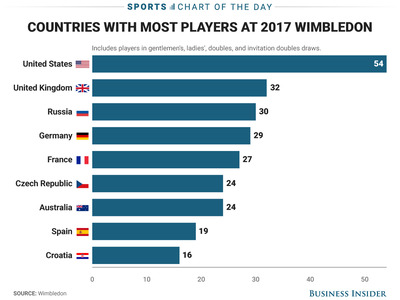 Of the more than 500 players who comprise the fields in the men’s, ladies’, doubles, and invitational doubles draws, 54 come from the United States. The United Kingdom is next with 32, followed by Russia with 30. In all, half of all the players come from just nine countries.